What’s the secret to game marketing success? And which app promotion strategies are the best at delivering results? Well, we reached out to a few of our most successful Buildbox developers that have become app experts at not only creating great games but gaining massive exposure for them also, to get their opinion on the topic. What would be your advice to indie developers that want to get their game noticed? As far as app promotion and game marketing strategies go, what do you think is the most important strategy that game developers should follow? – Share on social and forums on your progress of your game – People love to follow your progress! – Keep knocking on doors – One will open sooner or later! As far as app promotion strategies go, I don’t think there is a one size fits all approach. You really need a holistic view. It totally depends on the game/app. But like I mentioned above there are a lot of ways to go. If I had to name one strategy it would be: Make a great game – It can really be that simple. Marketing a great game is a lot easier than marketing a bad one. DeadCoolApps is a small, indie mobile game studio based in Edinburgh, Scotland. Founded by Simon Crack in 2012, they have created over 300 apps, reached the top charts many times and generated tens of millions of downloads. DeadCoolApps are proud to have been Featured by Apple 14 times in New Games We Love. You can follow DeadCoolApps on FB, Twitter & Instagram. “Start early, and I mean early. As soon as you have anything at all to show, start posting on your blog / social media channels. These can be early sketches or concepts, and videos will always perform better than flat images. Post regularly, make the commitment and weave this into your development cycle. People live there lives in weekly cycles, so be sure to at least post on the same day every week. People don’t notice announcements; they notice consistency. Keep posting even if no-one is watching, commenting or reacting, especially when starting out. It can seem like a waste of time, but there will be a point when you’ll start to see a little traction, the biggest companies in the world all started with that first post. Documenting your journey of building the game is by far the best way to build up some engagement, and it also has the side effect of keeping you accountable and on track time wise. There’s nothing like a bit of public accountability to keep you pushing on, certainly through the tough times where you’ll need to plow through and complete the project. We always post on our Facebook page every Friday ( and often more during the week ) and always post screenshots or video’s for #screenshotsaturday on Twitter. 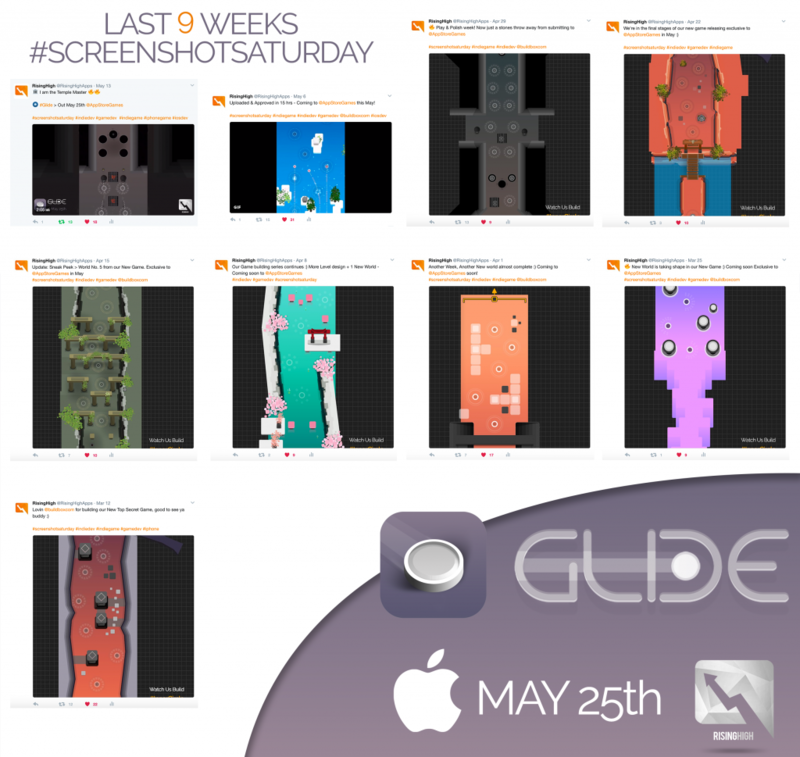 From the 8-12 week development cycle of our latest game ” • Glide ” ( Featured by Apple in 112 countries ), we posted pretty much as soon as we had something to show and continued right up until our launch day. While there is an argument for worrying about copycats, the biggest issue is not being ripped off or cloned. This will always happen eventually, the real problem is not being seen at all. Keep an eye on the biggest mobile game focused websites out there and pay attention to articles that they are interested in. Make a note of the editors and follow them on social, like their tweets and occasionally reply to them if you have something genuine to say, this can be just enough to break that ice when you finally come around to pitch them. It’s no longer about huge promotional pushes or bursts, but more to do with long-term updates and prolonged, sustained work. Sure, these social media blasts and influencer promotions work and can be super effective, but to maintain ranking, you’ll still need a solid game to once that blast tap is turned off. The biggest app promotion you can do is build the best game you can, based off solid research and proven mechanics. I realize this sounds like a poor answer, but actually, it’s the honest truth. Kevin Wolstenholme is the founder of the UK-based indie game studio, RisingHigh. They’ve been featured by Apple in ‘Best New Games’ 12 times along with several ‘Get Your Game On’ features by Amazon. You can follow RisingHigh on FB and Twitter. “Well, of course, you need to make a good game. This is easier said than done. You have to study game design, analyze games, and make games. I recommend failing fast and a lot. You must first make a lot of bad games before you get to your good game. Once you do get there, you don’t need to do too much other than email a publisher and send a short trailer of your game. If it’s a good game, it will speak for itself. David Reichelt is a game designer and creator of the hit Color Switch (which has amassed over 150M downloads worldwide). It was also ranked #1 in All Apps in over 50 different countries across the globe and broke the App Store record for holding the #1 spot for the longest length of time, a jaw-dropping 27 days. You can follow David Reichelt on Twitter & Instagram. “The game graphics and screens should sell a game to players. Invest the biggest part of time into improving art-style and game graphics. Also, make good video trailer and localized description. When only one screen can sell the product – you did a great job. Akim Kasabulatov is an Indie developer. He’s been making games professionally for several years and playing games since he was five y.o. His accolades include Osteya: Adventures (App Store Best of 2016) Developer and the Apple Featured game, Dropper! You can follow Akim Kasabulatov on Twitter. I’d like to thank all of the developers Simon, Kevin, David, and Akim for taking the time to share some of their best game marketing strategies and advice. Make a great polished game. A great game will be able to sell itself. Start marketing your app early. Do your research. Study other games, game-focused websites and stay up-to-date with the latest trends. Document your game development journey. It’s an excellent way to help build a community around your game. Make getting press and reaching out to influencers a priority. Get active on social media and post regularly. Remember consistency is important. Experiment with different Ad campaigns. Pitch to Apple and try to get your game featured. Make sure your game graphics and art-style are cohesive and polished. Don’t depend on one strategy or specific channel to effectively promote your game, use multiple strategies and platforms. Post on social media, forums and Product Hunt. Remember, game marketing isn’t easy. Don’t give up. Keep at it. Failure is just success in progress. You have to keep making games, learning, improving and promoting until you find success! The mobile paid ads and the Facebook ads will work best for the game app. I have seen many gaming companies are spending millions of dollars on the promotion. They generally focus on the app download ads. The gaming industry now became the crowded place. You should try different things to attract more gamer’s in your industry. The simple and easy to play a game does the best in the gaming industry. I feel referral marketing works best in the gaming industry. You can ask your users to share the game with their friend and get some incentive in return. Keep the incentive high so the sharing will become interesting for the users. This way you can reach millions of users in the short period of time. The incentive can be anything. You can keep cash, some game hidden features that they can access after they share your game or score upgrade etc.